In 1985, the Philippine Movie Press Club initiated the Star Awards for Movies and Television, which is currently the Philippines’ Golden Globes’ counterpart. The very first recipient of Star best actress was Nora Aunor for Merika while Vilma’s movie Sister Stella L. received the movie of the year award. Vilma Santos was nominated for Palimos Ng Pag-ibig in 1986 but failed to win the best actress. Unfaithful Wife was judged the STAR best picture of this year. The next year, Vilma’s film, Saan nagtatago ang pag-ibig was proclaimed the movie of the year. Vilma received a best actress nomination for her FAMAS winning film, Tagos Ng Dugo. The fifth year, Vilma was nominated again, this time for Ibulong Mo Sa Diyos. PMPC finally gave the trophy to Vilma in 1989 Star Awards. Vilma’s Pahiram Ng Isang Umaga four major awards: actress of the year for Vilma, supporting actor for Eric Quizon, director of the year for Ishmael Bernal, and Movie of the year for Regal films. Pahiram also won technical awards for cinematography, musical score, and production design. 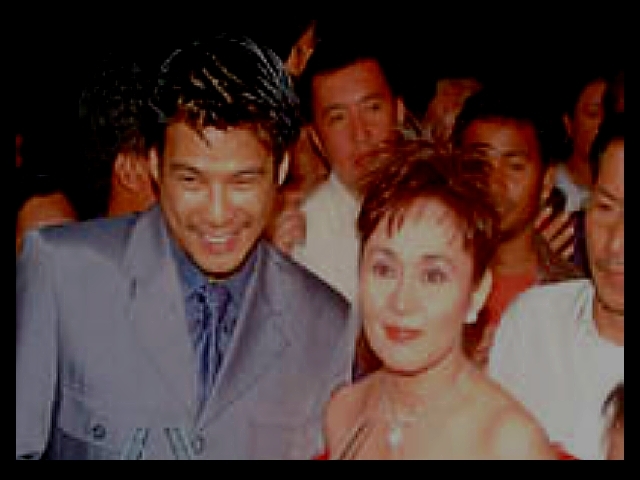 The following year, Snooky Serna won the supporting actress for Vilma’s “Hahamakin Ang Lahat.” Vilma was nominated for Hahamakin but the Star went to Nora Aunor for Andrea paano ba ang maging isang ina. Despite the lost, Vilma received a very special award from the PMPC, the “Darling of the Press” award. The next year, 1991, Nora Aunor again received the Star Award Actress of the Year for Ang totoong buhay ni Pacita M. Vilma was nominated for Ipagpatawad Mo. In 1992, Vilma was nominated again, for Sinungaling Mong Puso that Lorna Tolentino won for Narito ang puso ko. After winning her first Star Award in 1989 and nominated three consecutive years, Vilma finally win her second Star in 1993 for Dahil mahal kita: Dolzura Cortez Story. The next year, Vilma was nominated for Nagiisang Bituin but Dawn Zulueta took home the trophy for Buhay ng buhay ko. In 1995, Nora Aunor was the big winner again with her film, Flor Contemplacion Story. Then in 1996 was Sharon‘s grand slam year. She won the Star for Madrasta with co-star, Christopher De Leon taking the actor of the year. In 1997, Zsa Zsa Padilla defeated Nora, Vilma, Marecel and Sharon for actress of the year for Batang PX. Vilma was nominated for Hanggang Ngayon Ika’y Minamahal. Vilma was the big winner in ’98 for her film, Bata bata paano ka ginawa. She won actress of the year while co-star Serena Dalrymple won the supporting actress. Elizabeth Oropesa followed Vilma’s win the following year via Bulaklak ng Maynila. The new millennium brings another Star to Vilma as she claimed her fifth actress of the year for her film, Anak. The next year the Tuhog was the top film while Snooky Serna won the actress of the year for Habang kapiling ka. This entry was posted in ACHIEVEMENTS, ARTICLES and tagged ARTICLES, AWARDS, PMPC, PMPC STAR and Vilma Santos, STAR AWARDS. Bookmark the permalink.